March 2011 | MMA Fighting Events Videos Techniques UFC Fight Picks and News. Last Saturday at UFC Fight Night 24, Chan Sung Jung a.k.a the Korean Zombie made MMA fans go wild as he pulled of the first twister submission in UFC history. I almost committed a party foul by coming close to spilling my drink as I jumped out of my seat in amazement. Luckily, I was able to hold on to my drink as the Korean Zombie held on to the twister and submitted Leonard Garcia. The twister submission was made famous by Eddie Bravo, but most experts see it as a low percentage submission that wouldn't work in high level MMA competition. The Korean Zombie surprised MMA experts! By pulling off the twister submission, Jung earned a post fight bonus of $55,000. The UFC matched up Jung and Garcia in a re-match because of the chingasos trading war they engaged in during their first fight. I'm sure the UFC was looking for another exciting performance, but the twister submission being pulled off and making history was much more than what they probably expected. This submission will go down as submission of the year, and possibly the decade! Here's a free video of Chan Sung Jung (The Korean Zombie) vs. Leonard Garcia I found on youtube. Check out the Zombie pulling off the twister submission. Last Sunday, Chingasos MMA accepted an invitation from Anthony Eisenhower, head instructor at Brood 9 Martial Arts in Los Angeles, California. We were excited to see what was going on at their gym and took a Sunday morning drive to Brood 9 Martial Arts. The Sunday morning conditioning class at Brood 9 Martial Arts starts at 9:30 a.m. but we got there a little early and got to see Anthony do some pad work with their boxing and Muay Thai coach Khru Dan Peterson. It was clear that Khru knew how to teach how to throw chingasos (boxing and Muay Thai strikes), and that Anthony knows how to throw them. Luckily, I was watching Anthony punch the pads, and not my face. Jon Jones fights for the UFC light heavyweight title on Saturday March 19th at UFC 128. He will be trying to take the title away from Mauricio "Shogun" Rua. Jones has made it to a title shot in the UFC, but have you ever wondered how he looked when he first started in MMA? Well, you don't have to wonder anymore. Here is the free fight video of Jon Jones MMA debut fight. I bet there wasn't many MMA fight fans in the crowd that night that would have guessed Jon Jones would be fighting for the UFC title a few years later. If you're a fighter just starting in MMA, keep working hard. You might get your shot to throw chingasos in the big show one day! A while back I did a review of the Combat Kettlebell Systems Volume 1 DVD. Last Saturday I got the opportunity to attend the first ever Combat Kettlebell Workshop at So Cal MMA, an MMA gym in Los Angeles. Joey Alvarado, creator of the Combat Kettlebell systems and co-owner of So Cal MMA led the kettlebell training for MMA workshop. To be honest, I thought the workshop would be fun, but I wasn't expecting to learn much. Boy was I wrong! If you enjoyed the DVD, the workshop was even better. It was awesome to have the man himself walk you through the exercises, explain the correct technique and correct common mistakes. It was also great to hear him talk about his experience and philosophy behind his method and it's application to MMA and other combat sports. Joey did a great job of teaching and presenting his kettlebell training method. Best of all, he did it in a down to earth and humble way. An added benefit of the workshop was that it was a bit of a who's who in MMA and fitness in the Los Angeles area. Mark De Grasse of www.MyMadMethods.com, Anthony Eishenhower of Brood 9 Martial Arts (www.Brood9.com), Samson Ramirez of Nutrition 4 Less (www.iWantN4L.com), Shawn Powers of www.UndergroundStrengthCamp.com, and MMA fighter and cardio machine Oscar Torres were all in attendance. Not only were they in attendance, but during the breaks, they eagerly traded fitness tips, tricks and ideas. 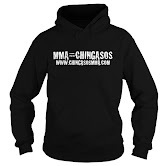 Check out So Cal MMA student and cardio machine Oscar Torres throwing chingasos! If you're looking for a tool to add to your strength and conditioning tool box, definitely get the Combat Kettlebell Systems DVD. If you get the chance to attend the workshop, I would highly advise you to jump at the opportunity. You will learn different methods on how to use kettlebell training for MMA. Joey's kettlebell system will definitely enhance your MMA and or submission grappling game. Check out more pictures on our Facebook page www.Facebook.com/ChingasosMMA.